People often approach kayak self-supports the same way they would approach backpacking trips with a strong emphasis on light weight packing, but the reality is that, on many trips, the river does all the carrying for you and weight can be much less of a concern. There are rivers — with portages, challenging whitewater, hike-ins, etc. — that are appropriate for an ultra-light approach, but there’s no need to approach a long float like the Grand Canyon as an ascetic. Most people say they gain weight on Grand Canyon raft trips and there’s no reason that can’t be true on a self-support too! There are a lot of factors that go into this. First and foremost — are you hiking in (or out)? If yes, the answer is clear — go light. If you’re not hiking in, you may still have extensive portages on the river — or you may be unsure. Either way, it’s best to plan with that in mind, as a few pounds of weight makes a significant difference when you’re schlepping your stuff up and over huge boulders or out of a canyon. The less obvious question is, how comfortable are you on the river? Paddling a loaded boat on a multi-day is unavoidable, but paddling an overloaded boat is not. If you’re pushing your limits with the whitewater as it is, you’ll probably want to keep the weight down as much as possible. If it’s basically a booze cruise and the whitewater is casual for your ability, then load’er up! The river will feel more exciting when you realize you can’t turn your kayak. 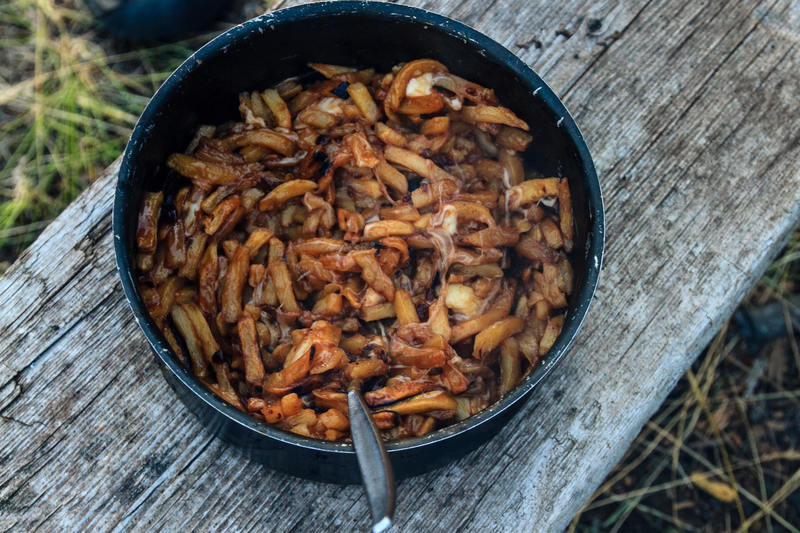 Poutine on the Stikine — some people think it’s worth the sacrifice to eat better than Mountain House even on the hardest rivers. I’m inclined to agree! 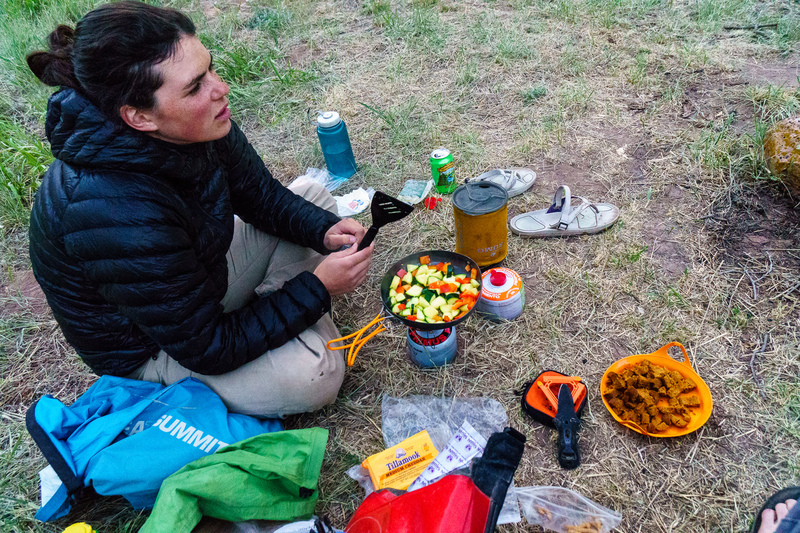 If you’ve thought about your trip and decided ultra-light is the way you need to go, you probably only want to bring enough cookware to boil water. This doesn’t leave you with a lot of choice in the meal department; dehydrated meals and oatmeal are the bread and butter of the lightweight traveler. I find that Mountain House and other brands tend not to have enough calories (despite their cost…), so when I do go this route, I supplement with a pack of sausages that I can just pop on a stick and cook over the campfire. An onion or pepper doesn’t hurt either; chop it up and throw it in with the dehydrated meal to freshen things. I’ve also dehydrated meals at home — a dehydrator is pretty cheap and easy to use! — but the convenience of the store-bought freeze-dried meals in mylar zip-locks is hard to beat for the weight-conscious paddler. Daphnee Tuzlak strikes a balance on the Dolores — no cast-iron skillet, but plenty of fresh food, a multi-part cooking setup, and a beer with dinner. The other end of the spectrum? Bring the kitchen sink. On class IV or easier, if I know there will be no portaging, I bring a cast-iron skillet and use it on the fire to cook the same meals I eat at home. Fresh veggies, meat, beans; pretty much whatever. The only limiting factor is how long the food will last. On a winter Grand Canyon trip, you can push it pretty far as the water temp keeps your boat cold. In these situations, space can be at a premium, but weight really isn’t, so go nuts on the luxuries and just cook like you would if you were car camping (or rafting)! How Much Beer Can I Bring? 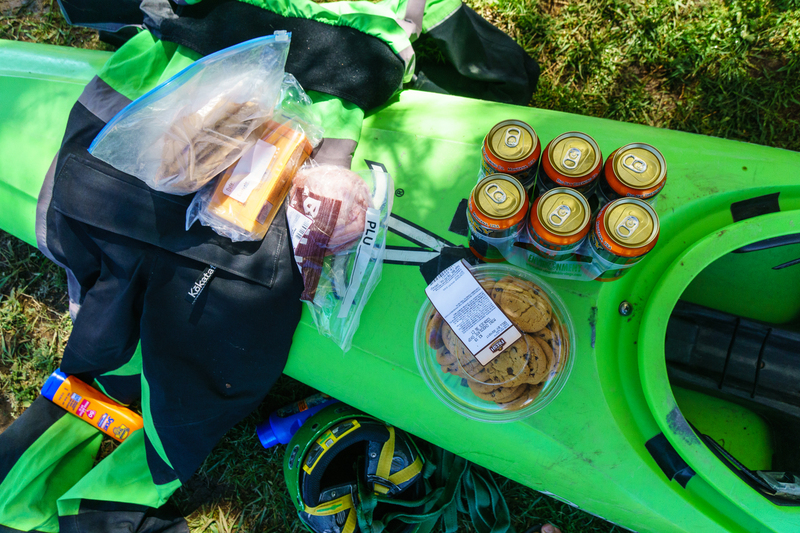 Loading up the essentials — cookies, beer, and cheese.